This is a so-so machine. And having looked at a lot of these portable washing machines, this one is probably just as good as a lot of them. But, basically, it is still a lot of work, and won't do very much in a single load. You can fit about a day's worth of clothing in here, so if you're on the road and need to travel light, you could stick this in your trunk and then bring it into the motel room each night for a load. But otherwise, washing your clothes everyday is kind of a pain. It is electric, which some are not, so it is easier than using one that you have to hand crank. But there is no water hookup, so you have to fill the bucket by hand, which is difficult if you don't have a large sink or bathtub to use. Worse yet, when it's done, you have to dump out the water by hand. And when it is full, it is pretty heavy. Then you have to hand rinse and wring the clothes, piece by piece. So, like I said, this is a lot of work. If you really need a portable washing machine, this is probably a decent choice, as good as any other. But, as you can probably tell by now, it doesn't really thrill me. When i first used it, i was shocked the cabinet does not fit perfectly there are gaps in the construction. the thing bounces all over the counter as there are no rubber stops to keep it from bouncing all over the counter. it does not hold much water, and you can only wash a very few clothes at a time, which results to using more soap and bleach, i bought the damn thing and can't afford tio buy a different one, so i am stuck with it. my overone fell off the counter as i took the top off (my fault) I REALLY MISS IT!!! I have wanted one of these washing machines for the longest time but never had the money. I just got my sister's that she didnt want anymore. She had the box and manual and everything. I'm not giving it 5 stars because it doesnt say how much soap or detergent to use. I'm coming up with a lot of soap left and keep rinsing a bit by hand in bathtub and then back for another cycle to get more soap out. I wish i knew how much detergent to use for like 2 or 3 toddlers sleepers! It's on it's 5 spin now. The last load i broke down and sent it down stairs to the regular washer to do a final rinse. I'd use it for socks and stuff with hard stains. I'll use it for emergency jammies and stuff as well but not as much. Mostly the under garments. I wanted it to keep caught up on laundry and use the big washer for towels and bedding and stuff and use this to do the things we run out of quick, socks, underwear and undershirts. I'm still playing around with it but i do love it so far. Gonna try just a few drops of detergent the next few clothes i put in though. Maybe i wont have so much rinsing to do. I purchased the Wonder Washer portable washing machine from Amazon.com after seeing a commercial for it on television (I know, I am a sucker for that stuff). I thought it would be useful after having a baby to wash soiled clothes instantly instead of waiting for laundry day and letting the stain set in. Well, it WAS great for baby items, especially in the infant months where spit up was an hourly ordeal. It is also great for small items like socks and underwear, something my husband seems to constantly run out of every week. I also found it very convenient for washing delicates, instead of filling up a bathtub with water and Woolite and hand washing everything. It was much easier to plop them in the Wonder Washer and let the machine do the work! The only major drawback to the Wonder Washer is definitely how tiny it is. It does not fit many articles of clothing in it, so it is really best used in those “emergency” situations when someone runs out of socks, or the baby vomits on her onesie. I also felt as though it was a little pricey, considering when I received it, it was made of a cheap plastic, and the lid did not lock on tightly. You are supposed to be able to drain the water from the unit using the small holes in the lid, but every time I tried, the lid popped open, dumping my clothes in the sink. You are better off rinsing them yourself, making it a bit less convenient. I can see this being a great little machine for someone who has to take their clothes to the laundromat. I remember having to use a laundromat when I lived in an apartment, and it proved to be a creepy experience more than once. I wish I had known about this machine then- I would have washed all my undergarments at home first, and only taken my regular clothes to the laundromat! So I take a lot of trips with my kids. They constantly have soccer tournaments and their uniforms always need washing so I decided I needed to get a portable washer and I could just dry everything on a balcony or in front of the air conditioning. It was getting really time-consuming trying to find a hotel in all the different cities or having to drive around looking for a Laundromat in a town I was hardly familiar with. 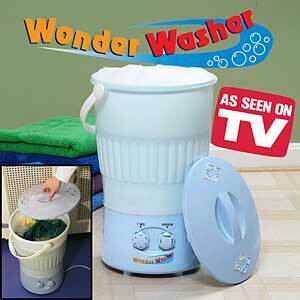 So I finally bought the Wonder Washer from a television infomercial. It’s really convenient and is portable. The size is perfect for packing, even fits in most carry ons. The washer can wash anything from delicate blouses to even the most soft sweaters. The best thing about it is that all you need is your dirty laundry, soap, water and then you find a plug in your room and plug it in. It doesn’t operate with batteries making it the ideal traveling washer. It was only fifty-five dollars without shipping charges and it really works on just about all clothing and does a good job washing and getting them clean. It works with pressure and heat and it works very quickly. It even gets hard to remove stains out. I mean obviously it won’t wash as much as a big washing machine. It holds up to 7 liters. It’s a great idea if you live on a boat, in a dorm or RV. It doesn’t even make a lot of noise and it weighs less than 10 pounds so it’s ideal for anyone. The only difficult thing is that since there is no rinse cycle you have to pour the water out. So you have to dump and rinse the detergent off. The rinsing is a bit annoying but it still is better than having to take your laundry out when you’re tired after a long day. And it is definitely better than handwashing. Just remember to buy a fold out dryer for the clothes to dry. Used it for apartment dwelling, after 3 or 4 washes, the motor started to go and the tub did not spin anymore. Way too much work, does not have an agitator only a spin one direction and spin to the other direction. Pretty much a bucket on a motor. After washing clothes in regular machine after using this product, clothes still had dirt in them and lots of soap. Useless product.